An influential EU shale gas group is losing environmentalists, as it’s taken over by executives, who use it to lobby for fracking. Opponents allege a clear conflict of interest when a majority holds a patent in hydraulic fracturing. Only 10 environmental experts were present at the shale group’s last meeting in February, compared to the 70 who are in some way associated with fracking and/or investment in related technology. The relatively young European Science and Technology Network on Unconventional Hydrocarbon Extraction insists it’s tasked with researching new technology – including fracking – and has nothing sinister up its sleeve. The EU insists the network is for assessing current projects and recommend appropriate technology and strategies for gas and oil extraction, including risk-assessment. However, green energy advocates in the EU believe this to be a smokescreen and that energy in the EU is basically going in the opposite direction. Meanwhile the presence of green advocates is just a façade to ‘greenwash’ the actions of big gas companies. The February meeting was billed essentially an invitation to fund new green initiatives and conduct research into the environmental risks posed by the industry today. But critics of the panel also noted that the event led to €113 million being funneled into the fossil fuel industry, essentially for tasks it would otherwise have to pay for itself (numerous grants from the sum went to university studies supported by the likes of oil giant Halliburton). The two-year-old network of experts is led by five chairmen. Two are executives from shale firms; another two are officials from ministries in the UK and Poland, which have strongly backed hydraulic fracturing. The list is topped off by the director of a company who also holds an adviser’s chair on the Shale Gas Europe lobby group. Environmentalists from Friends of the Earth are not happy that their green name has anything to do with the shale gas industry. Another group that is joining the chorus is the Corporate Europe Observatory. The watchdog’s Pascoe Sabido told the newspaper that “with the dirty energy lobbyists are clearly setting the agenda, no one can take Europe’s climate ambition seriously. But the European Commission insists the network it backs is an impartial body that merely aims to study and research any new technology in the field, to help a joint policy along. “It is necessary to continue increasing our knowledge on unconventional hydrocarbon extraction technologies and practices in order to further reduce potential health and environmental impacts and risks,” a spokesman with the commission told the newspaper. 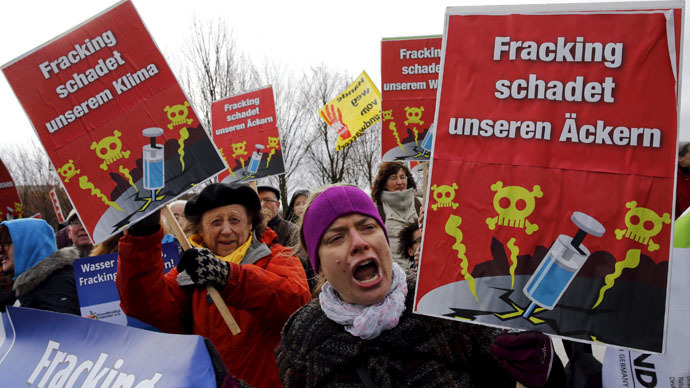 The European bloc allegedly showed a willingness to at least verbally advocate that both critics and proponents of fracking be taken into account at the panel’s meetings. But Friends of the Earth says this hasn’t happened yet, and is very skeptical of the work being done by the shale gas industry to appease the environmental lobby. “While a ‘science and technology network’ on unconventional fossil fuels sounds objective, it’s a complete façade – the European commission is giving the oil and gas industry all the seats at the top table,” Simon continues. Other groups have continued to strike out at opponents of green energy. An investigation by Greenpeace into the UK’s Climate Change Minister Matthew Hancock has revealed in April how he accepted a sum of £18,000 from one of the country’s biggest climate-change skeptics. Oxfam UK has also on numerous occasions criticized the industry, believing it stands for profit over security. The UK government has also caused outrage among citizens and advocacy groups for backtracking on its promise to pass new fracking restrictions. Under the current regulations, national parks are fair game, as long as the well lies outside a park’s boundaries. Prime Minister David Cameron has said in the past that Europe and the UK need to when themselves off Russian gas as soon as possible. Meanwhile, evidence of hydraulic fracturing’s detrimental effects on the environment and people’s health continues to pile up. From the increased likelihood of cancer, to ugly birth defects to earthquakes – it’s all there. Over in California, where the current drought is so serious it’s leading to full-scale policy changes, fracking was responsible for draining 70 million gallons (264 million liters) of water in 2014.